For locals and visitors to Adelaide, here are my favourite value for money dining experiences for meat lovers. Adelaide is a multicultural city, and the choice of restaurants reflects our history. There is a lot to be excited about with this Glenelg institution. It features the star dish, the meat platter for two. In reality it feeds a family of four for at least two meals. The meat is high quality, charcoal grilled, and perfectly cooked, and includes chops, a pile of shredded chicken and lamb, chicken wings, sausages, skewers, bacon and more. Served with large cut potato chips, salad, yogurt dipping sauce and pita bread. Delicious add-ons for a mega feast are the zucchini balls and the seafood platter. The dine in atmosphere is like sitting at a long table, but split into smaller tables right next to each other, with lots of noise and a bustling, friendly atmosphere. The staff are wonderful. Take away is also available and there is a good selection of Greek pastries. Make sure you ask to take the leftovers home if you dine in. Cost; about $90 for the meat platter, and well worth it. We drive to the other side of town to eat here. The restaurant is spacious and with a relaxed atmosphere, and has a separate banquet room. The meats are all char-grilled and cooked Afghan style. There is a choice of minced, diced or flattened out chicken or lamb. The flattened-out chicken is delicious, served with a choice of rice or bread, salad and two dipping sauces, harissa and yogurt based. The bread is so fresh it melts in the mouth. Other than the usual fridge drinks, there is also a selection of freshly made juices. The staff are helpful and friendly. Cost; about $15 – $18 per plate, freshly made drinks $6 – $8. With several good German Hotels in picturesque Hahndorf it’s easy to mix them up, but the Hahndorf Inn is over 150 years old and features “SA’s taste of Bavaria”, which must mean huge amounts of delicious meats. With lots of solid wood and stone, the inside of the Hahndorf Inn is welcoming and sets the scene perfectly for the style of food. The Taste of Germany Platte is the Bavarian version of Kefi’s meat platter for two. 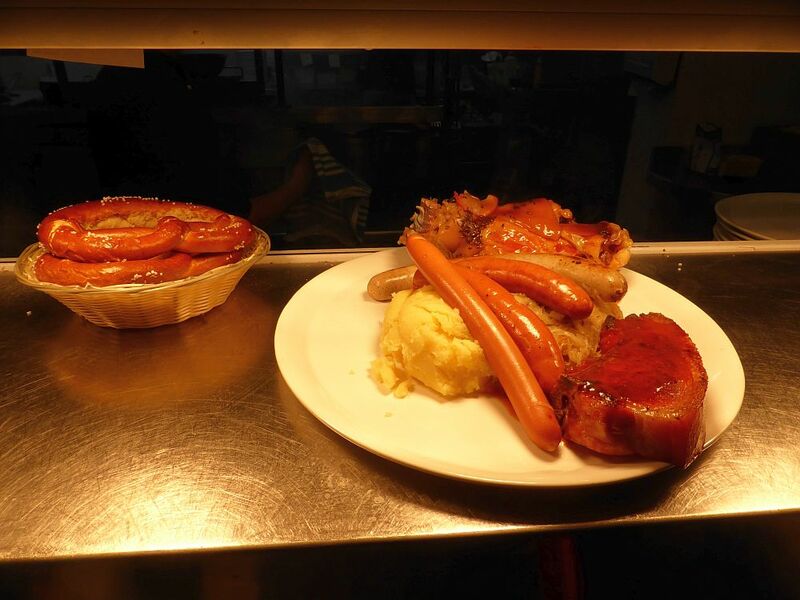 It features Vienna, Bockwurst, Bratwurst and cheese Kransky sausages, smoked Kassler chop, Eisbein pork hock with mashed potato, sauerkraut, pork jus, mustard and fresh baked Bavarian pretzels. 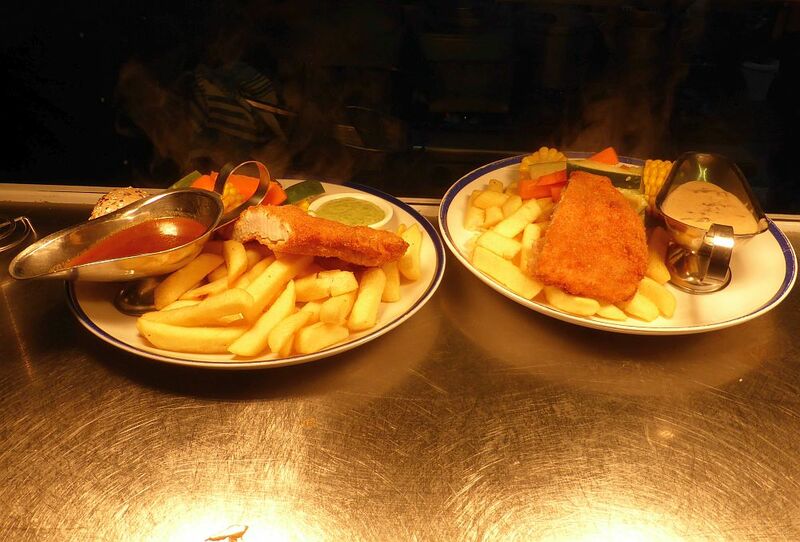 There is nothing small about anything that comes out of the Hahndorf Inn. Huge flavours, huge serves, huge hospitality. My favourite is the chicken breast schnitzel served with chips, salad, house made garlic herb mayonnaise, and delicious mushroom sauce in a jug, yum! The one on the left is a half schnitzel. Keep in mind the plates are larger than average. If you are feeling especially brave, the Giant Hot Dog is exactly that, and would easily feed four people. Cost; at around $30 for a schnitzel with sauce, $45 for the Giant Hotdog, and the Taste of German Platte at $75, it’s no wonder the Hahndorf Inn is a magnet to international meat lovers.